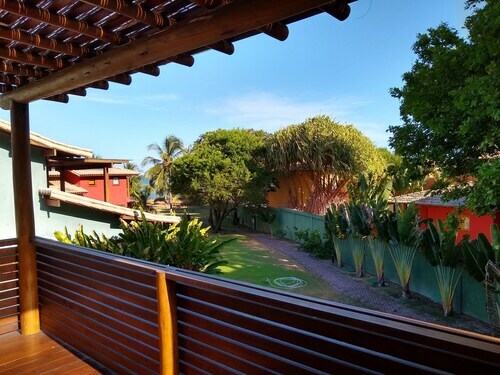 Located in Historic Center, this hotel is within 1 mi (2 km) of Mucuge Street and Arraial Eco Park Water Park. Pitinga Beach is 1.5 mi (2.4 km) away. 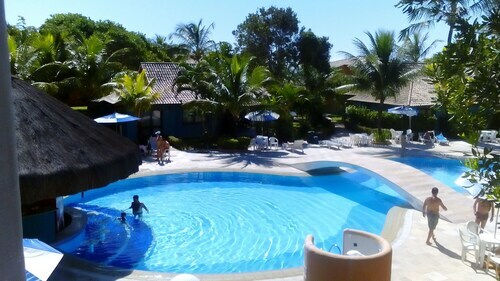 Offering direct access to the beach, this Arraial d'Ajuda hotel is within 1 mi (2 km) of Parracho Beach and Pitinga Beach. Arraial Eco Park Water Park is 1.3 mi (2.1 km) away. Located in Arraial d'Ajuda, this hotel is within 2 mi (3 km) of Mucuge Beach, Arraial Eco Park Water Park, and Pitinga Beach. Mucuge Street and Parracho Beach are also within 10 minutes. 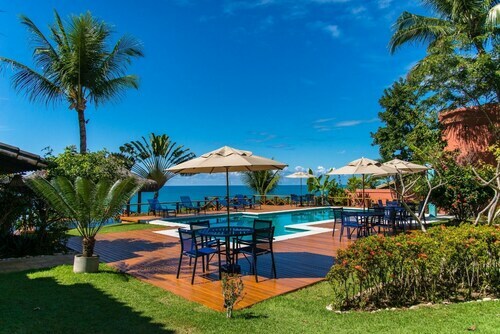 Located in Arraial d'Ajuda, this beachfront hotel is next to a golf course and within a 15-minute walk of Parracho Beach and Pitinga Beach. Arraial Eco Park Water Park is 1.8 mi (2.9 km) away. 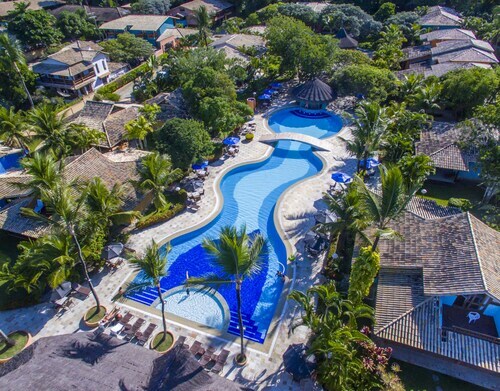 Located in Historic Center, this hotel is within 1 mi (2 km) of Mucuge Street and Arraial Eco Park Water Park. Pitinga Beach is 1.6 mi (2.6 km) away. 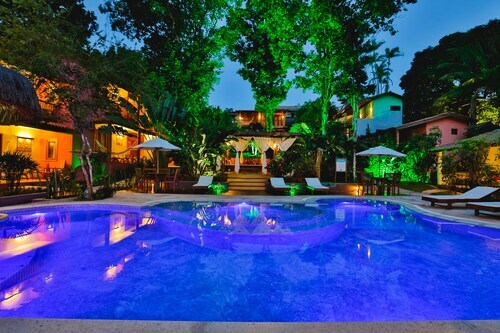 Located in Historic Center, this pousada is within 1 mi (2 km) of Mucuge Street and Arraial Eco Park Water Park. Pitinga Beach is 1.5 mi (2.5 km) away. 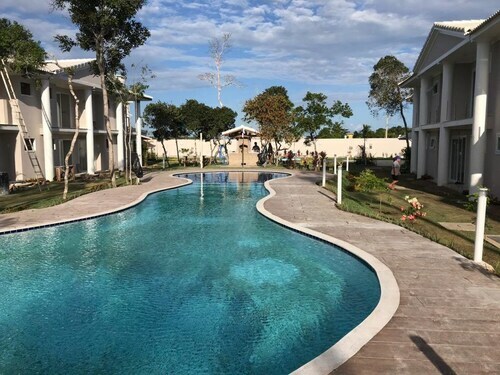 Located in Arraial d'Ajuda, this condo resort is within 1 mi (2 km) of Mucuge Beach and Arraial Eco Park Water Park. Pitinga Beach is 1.4 mi (2.3 km) away. Located in Arraial d'Ajuda, this vacation home is within 1 mi (2 km) of Mucuge Beach and Arraial Eco Park Water Park. Pitinga Beach is 1.4 mi (2.3 km) away. 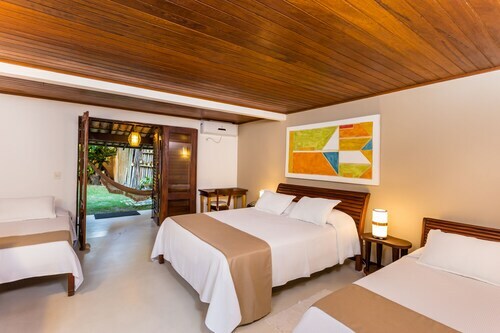 Located in Historic Center, this romantic hotel is within 1 mi (2 km) of Mucuge Street and Arraial Eco Park Water Park. Pitinga Beach is 1.3 mi (2.2 km) away. Excellent House, Walk in the Sand, in the Best of Arraial! 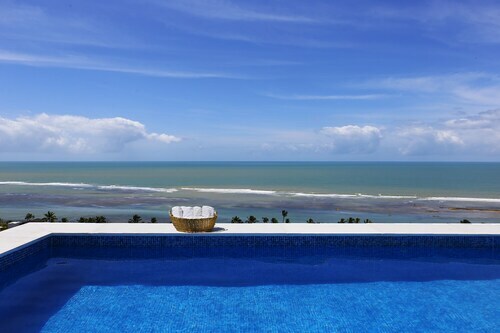 Located in Arraial d'Ajuda, this family-friendly Porto Seguro vacation home is within a 5-minute walk of Mucuge Beach and Arraial Eco Park Water Park. Pitinga Beach is 2.5 mi (4.1 km) away. Located in Historic Center, this pousada is within a 10-minute walk of Mucuge Street, Broadway Street, and Nossa Senhora D'Ajuda Church. Mucuge Beach and Pitinga Beach are also within 2 mi (3 km). 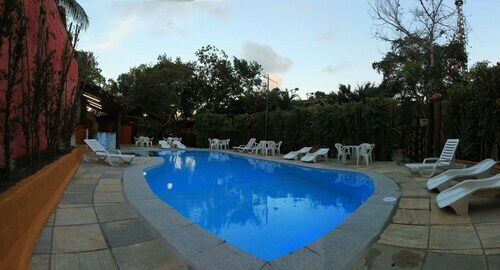 Located in Historic Center, this hotel is within 1 mi (2 km) of Mucuge Street and Arraial Eco Park Water Park. Pitinga Beach is 1.4 mi (2.2 km) away. A trip to Mucuge Beach is a great way to make the most of your next break. 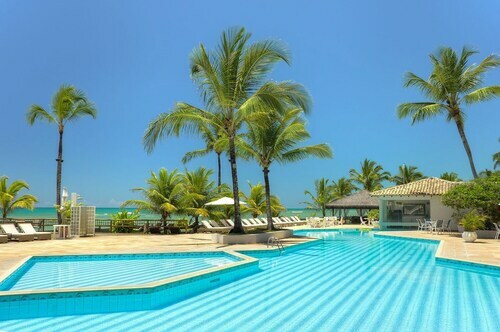 You will find it in Porto Seguro, 590 miles (950 kilometers) outside the national capital, Brasilia. There are plenty of accommodations in the immediate vicinity of Mucuge Beach. With 24 possibilities within 0.6 miles (1.0 kilometer), the only problem you might have is deciding which looks the best! When you're ready to start the search, check out the Saint Tropez Praia Hotel, Casa Grande São Vicente and Travel Inn Village Arraial. If you enjoy getting a bargain, the Pousada Catavento could be just what you're after, and it's only 0.2 miles (0.3 kilometers) away. 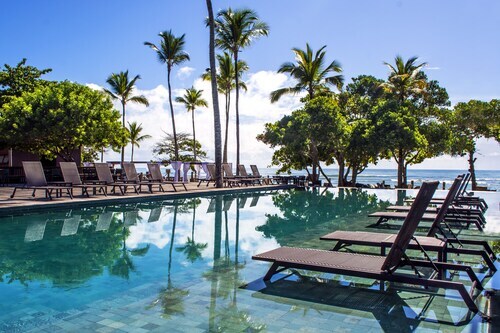 Kick back and relax in luxurious comfort at the Maitei Hotel, the lone high-end hotel around. It's located only 0.2 miles (0.3 kilometers) away. If you're the kind of traveler who does quite a bit of your traveling from behind a cafe window, then you're in the right place. Within quick stroll, Fior Di Latte Gelateria provides all the delectable drinks and treats you could desire. Another eminent local establishment is Benjamin, offering a broad range of meals and a convenient location. Don't forget that you're on vacation. You're allowed to indulge in a drink or two before heading back to the hotel, and Aldeia Baiana - Bar e Restaurante / Barraca de Praia is yet another short walk away. Arraial Eco Park Water Park is a thrilling water experience. When the mercury rises, this is the ideal location to cool off and relax. Get some respite from the heat in the water-based attractions at Eco Parque Arraial d'Ajuda. Make sure you pack your towel and sunscreen! Think about enjoying a visit to Nossa Senhora D'Ajuda Church, a peaceful place of prayer as well as a popular tourist attraction. Pack a picnic and spend the afternoon watching the people and tasting the salty air at Parracho Beach. If you're ever sick of the heat, head to Pitinga Beach, where you'll find instant relief in the water. How Much is a Hotel Room in Mucuge Beach? Hotels in Mucuge Beach start at $30 per night. Prices and availability subject to change. Additional terms may apply.